We have a large variety of sauces, candies & nuts for you to create your own masterpiece. Available in 1, 2 & 3 scoop sizes. All come complete with real whipped cream & a cherry! Our original creations! One for every taste, we promise you’ll love one of the concoctions below! Plus, we offer weekend cookie sundae specials and monthly sundae specials, so be sure to check in regularly to see what new ice cream creation we have on the menu! Our peanut butter cup ice cream, loaded with chopped real Reese’s peanut butter cups, smothered in hot fudge & Reese’s peanut butter sauce, topped with real whipped cream, chocolate sprinkles, a whole Reese’s peanut butter cup & a cherry. A must for any peanut butter & chocolate fanatic! Due to its incredible popularity as a sundae of the month, we have added this sundae to our permanent signature sundaes! The salted caramel macchiato features our smooth & creamy coffee ice cream drizzled with warm caramel sauce which is then sprinkled with sea salt covered in roasted almonds & topped with fresh whipped cream & a cherry! Strawberry ice cream drenched in hot fudge & strawberry topping, finished off with real whipped cream & a cherry! Rich, yet refreshing, our mint chocolate cookie features mint chocolate chip ice cream covered with an abundant amount of hot fudge & crushed real Oreo cookies then topped with our fresh whipped cream, chocolate sprinkles & a cherry! A cheerful sundae for the young at heart! Our super creamy black raspberry ice cream smothered in marshmallow sauce, premium white chocolate chips, real whipped cream, rainbow sprinkles & a cherry! A Scoop twist on a classic! Rich chocolate ice cream covered with hot fudge & caramel then sprinkled generously with chopped peanuts & finished off with fresh whipped cream, chocolate sprinkles & a cherry! Not a chocolate fan, but still looking for a more grown up sundae? We’ve got you covered. It starts with our very popular almond butter crunch ice cream which is smothered in warm butterscotch, covered in roasted almonds then topped with real whipped cream, sprinkles & a cherry! Our fresh baked, made from scratch brownie, topped with your choice of ice cream, hot fudge, marshmallow & walnuts and then finished off with whipped cream & a cherry! Not a fan of marshmallow? Don’t do walnuts? You’re in luck! 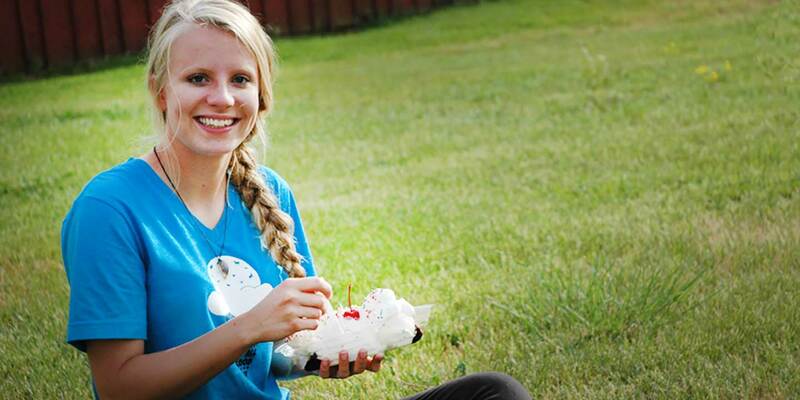 This sundae is completely customizable! In the mood for something traditional we’ll scoop you one with chocolate, strawberry & vanilla topped with hot fudge, pineapple, strawberries, walnuts, real whipped cream, a cherry & of course the banana! Feeling a little more adventurous? You can customize all of your ice cream & toppings-the only thing traditional is the banana!